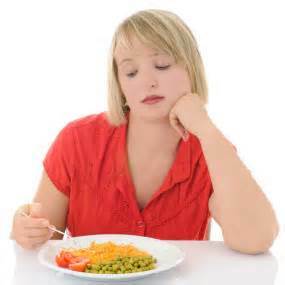 Food fatigue is where you are eating a lot of the same food day after day and it is bland and boring. Like eating oat meal everyday without anything to jazz up the taste. Rice, bean, oats, and wheat will keep you alive and healthy but it is horribly bland and you will get tired of eating it. Well, that is till you get hungry again and then it will taste great! Why 45 days? Seems to be the outside time-frame of most emergencies and disasters. For situations such as food chain disruptions or social problems it gives you a transition period that you can use to stabilize your specific situation. For a “grid-down” event where the food chain is permanently disrupted 45-days isn’t near long enough. However, you can use this food to “spice-up” your long-term staple food. I will talk about that food storage category in the next article. Should you store more than the 45-day minimum recommendation? Absolutely!! More for TEOTWAWKI (grid-down) situations or maybe just for when you retire. I have more, significantly more. I won’t make specific recommendations on what food to purchase. What I will do is suggest you purchase the food you like that can be put over rice or beans. Using rice and beans as “extenders” will easily extend your good tasting food by 2 – 5 times. And that is important to fighting off food fatigue. The next thing I would like to suggest is consider are fruits. Fruits will contain valuable and required vitamins to your diet. 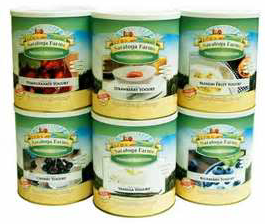 They are also great to add to oat meal to pick up otherwise bland tasting oat meal. Dehydrated apple slices from the LDS store are a great snack and extremely affordable. That is six #10 cans of apple slices with a 30-year shelf life for under $54.00!! All of the food mentioned above is Mountain House brand. 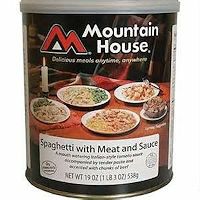 I think Mountain House has the best quality and flavor of all the freeze dried food brands. 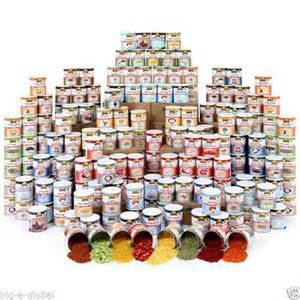 So here is a one of those “best kept secrets” that will make your food storage life a whole lots easier…LDS Home Storage Centers. Yup, The Church of Jesus Christ of Latter-Day Saints believe so much in food storage that they make is very easy and very affordable to purchase properly canned (#10 cans) long-term food storage. There are two options;, 1) on-line store with a more limited list of available foods, or 2) a great variety of foods you can purchase. Either way the time and money you save will be amazing. Now, if you are near one of the LDS Home Storage Centers that are scattered around the country it gets even better. At these locations the pre-canned food available it amazing! 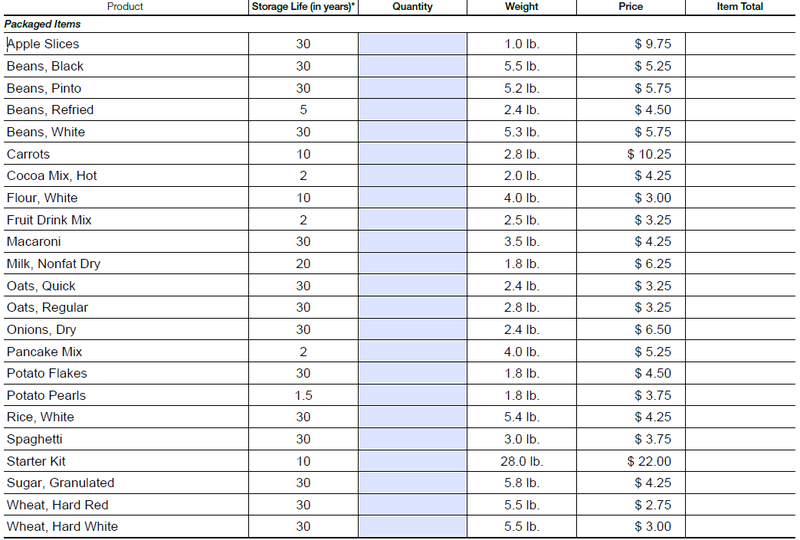 The order form provides you the shelf-life, and the weight per can, plus obviously the price. So you know exactly what you are getting. I have bought from them before and I am telling you that the quality of the food is outstanding! I really really like the apple slices as a snack. They rock!! You can find an LDS Home Storage Center by visiting the website locator page: We use to do a”group order” for interested folks. We would gather orders from folks and just send a couple people in a pick-up truck the 110 mile round trip to buy the cases of food. Everyone who didn’t go would chip in gas money. Then the food would be delivered to one location, someone’s garage, where everyone would pick up their order. A BBQ of hamburgers and hotdogs would always be a nice social event to top it all off. Yeah, it’s going to take some money to do this. However, in my way of thinking I would rather have all this food storage and not need it, than need all of this food and not have it. And remember, you can always eat the food! Even if you wait until your retirement years, you can still eat the food! The way I looked at it – this is part of my IRS, 401K, pension or whatever you want to call it. It will help reduce the food bills when I am retired if I don’t need the food before then.